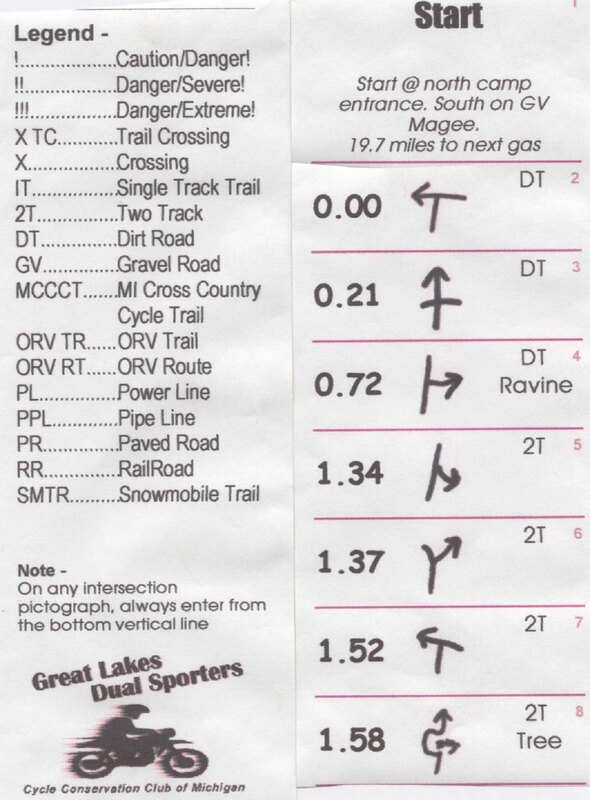 Much like Enduro riders, Dual Sport riders use route sheets to help them navigate the days’ course, but if you are new to off road riding or dual sports I’ll start from the beginning. To make your days’ ride easier the route sheet should be in a route sheet holder. This is a simple box that attaches to your handlebars that the route sheet, sometimes also referred to as a “roll chart” sits in. Route holders will have a clear plastic lens on top to view the chart inside and will have two knobs so you can advance or backup the sheet. These holders are made by various companies like, Moose Racing, MSR, orEnduro Engineering and can be purchased online or at most bike dealers. The route sheets that are supplied at all Great Lake Dual Sporter’s events are paper rolls just like the ones used on adding machines. These rolls are the Holy Grail for us Dual Sporters because on them are most of the information that is needed to ride the given event. So what’s given you’re asking? 3. And also a description of the road that you will be riding on. This example has been cut and laid side by side for this article. On the example which is an actual route sheet, the left side shows the legend, which is always at the beginning of the roll chart. This legend tells the rider how to read the text on the chart. On the right side of the example is what the rider actually reads while riding the event. The first thing is what the mileage should be at the approaching corner, either from the start or a reset. Then there is the pictograph which shows, in a very simple way, what the corner or intersection will look like and what way to turn. 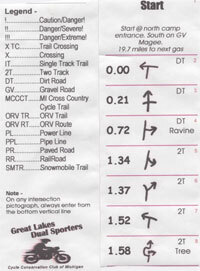 And finally the text that tells the rider what to look for or what kind of road you will be turning onto. The route sheet is advanced forward in the route sheet holder as you ride, and most holders will let you see three to four lines through the lens at a time. A very simple but effective way to navigate that is also used with your bikes odometer. Also supplied at all GLDS events is a very detailed area map of the days’ course and for the more techno geeks there is GPS data that can be downloaded to your GPS unit. With all this information at hand it makes it almost impossible to get lost, but for some, (me) they still manage to find a way.